Gold rim swallowtail, photographed at Daggerwing Nature Center, Boca Raton, Palm Beach County, in August 2013. 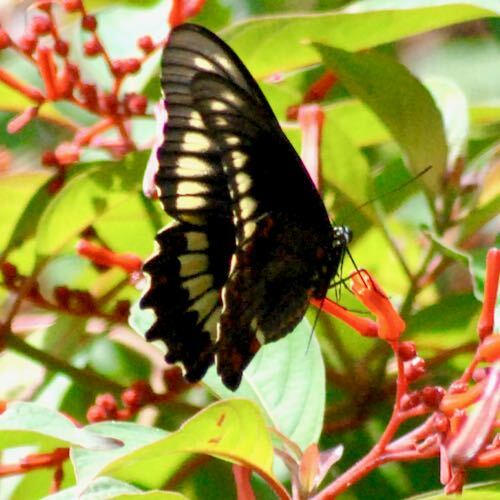 The gold rim swallowtail, Battus polydamas, is a swallowtail without a swallow tail. Which is why it's also known as the tailess swallowtail. Got that? It's a large butterfly, typically three-and-a-half to four-and-a-half inches across, mostly black when viewed from the top, with two yellow bands that run along the outer edge of each wing. The underside is more colorful — red spots run along the length of the abdomen; the hind wings more of a brown, with wavy red spots mixed in along the edges with dark arch-shapes and yellows and white. Look carefully at the bottom photo and you'll see some hints of these features. But the gold rim's most distinctive feature is the one that it doesn't have, the swallow tail. It is the only swallowtail sans tail in the eastern United States. Its native range is the Florida Peninsula and the Keys as well as the Bahamas. There's also a population in southeastern Texas and in the American Southwest, but it will wander into Florida's Panhandle and other parts of the Gulf States and as far north and west as Kentucky and Missouri. 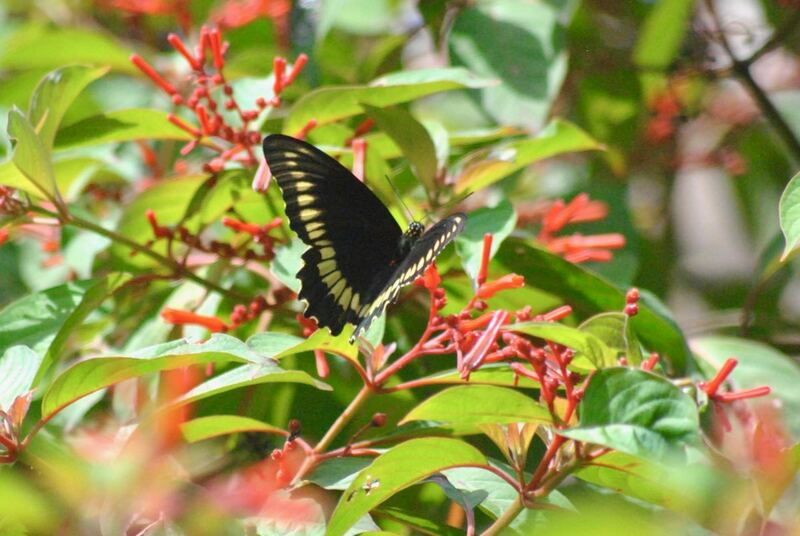 Gold rim swallowtails live as far south as Argentina. 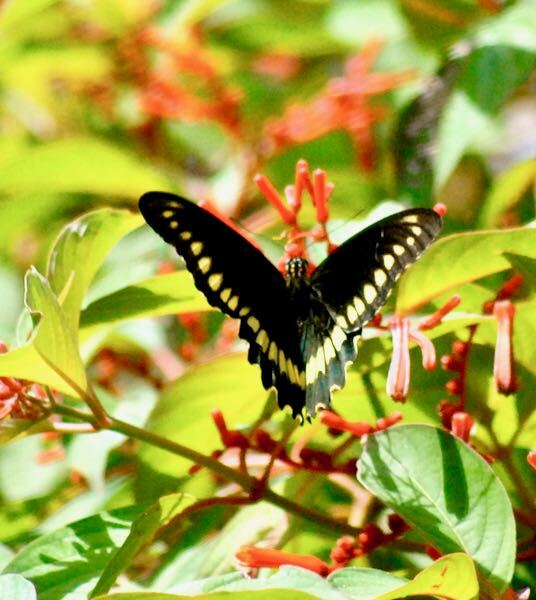 In South Florida and the Keys, gold rim swallowtails are active year round, but more limited in the northern portions of their range. Gold rim swallowtails up north winter over as chrysalises, or as pupae in their cocoons. Up north, they will produce to two or three generations per year, more down south. One other thing stands out about gold rim swallowtails: their diversity. There are at least 20 recognized subspecies of gold rims two of which are found in the U. S.
The Florida butterfly is known scientifically as B. polydamas lucayas. The other U.S. subspecies is found in Texas; the Florida version differs in that the yellow bands on the wings are wider than the Texas butterfly. Gold rim swallowtails use members of the Aristolochia species, better known as pipevines, as caterpillar host plants. They're called pipevines because their flowers are shaped like tobacco pipes. The best known member of the species is probably Dutchman's pipe. A female will lay a small cluster of eggs on the leaves; when hatched the young will devour the plant, taking in aristolochic acid, which apparently makes them distasteful to predators. The caterpillars will hang out together when young, but become more solitary as they mature. The adults are particularly fond of the nectar of lantana camara, which happens to be a Class I invasive in Florida, although popularly sold in nursery departments at big box home stores. Also on their nectaring menu:pipevines and honeysuckle. The gold rim in these pictures seems content nectaring on the flowers of firebush. Habitat for the gold rim swallowtail is open woods, old farm fields and disturbed areas, like roadsides. Gold rim swallowtails are also known as the polydamas swallowtails. They are members of Papilionidae, the swallowtail family of butterflies.